Was soooooo good! Check out my Review! I'm hoping The Girl in The Clockwork Collar is good. very nice haul. I have the first two Rachel Hawkins books but I haven't read either =\ I also haven't read The Girl in the Steel Corset. Sooo late to the party. Hearing you talk about this series has made me want to read it! Also super excited for you to read Girl With the Clockwork Collar (I haven't read the first book yet...gah! Must get on that). 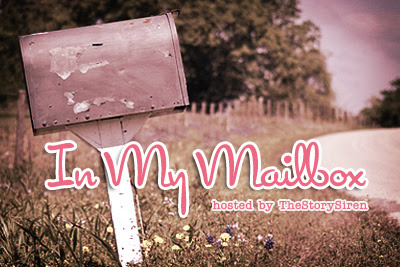 Great mailbox and super excited to read your reviews! Yay for Spell Bound! I can't wait to start it! I haven't read the first book in the Steampunk Chronicles, is that what it's called? But it is high on my TBR! Hopefully I can get to it someday soon! I can't wait until my copy of Spell Bound gets here! I wish you could come up & go to the Rachel Hawkins signing on the 28th. Enjoy please PLEASE!! For me...!! read it like a thousand times!!! Enough, sorry. Kind of freaked out. Here's what I got this week if you'd like to stalk OR just drop by http://bookpics-reading2alba.blogspot.com/2012/03/imm-20-surprises-edition-mrp-7.html? Kitty! I really need to read Demonglass soon. Hex Hall was so fun! Nice! I got ...Clockwork Collar last week and already finished it! It was really good! 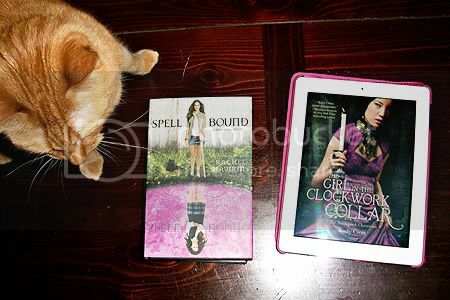 Also got Spell Bound but still need to read the second book now! Heard there was a cliffhanger and I wanted to avoid painful waiting!! Hope you enjoy ...Clockwork Collar! I received SPELL BOUND as well! Rachel Hawkins was in the area to do a signing!! I'm sad I haven't had time to read it, yet! I still need to read STEEL CORSET first, eep! Enjoy! I really want to read The Girl In The Clockwork Collar - it sounds so good! Looking forward to seeing your review. My IMM is over here. I've heard great things about Rachel Hawkins' book so I really look forward to pick up a copy of the first one in the series ..
i got spell bound. think i need the clockwork collar too =) enjoy! I really need to read more books about the Rachel Hawkins series. this one sounds so good! Enjoy! I got Hex Hall this week and excited to read it! Happy reading! Books in series I've heard great things about and need to start myself. Enjoy! Enjoy both books! Both have beautiful covers. I have Hex Hall just sitting on my shelf, waiting to be read! I really need to get to that one soon! Nice haul! Happy reading! *jumps up and down* SPELL BOUND. SPELL BOUND. SPELL BOUND. yes, please, please, I really want this book. So bad. This is the last book. *grabs head* I CAN'T BELIEVE IT.